Bring a pot of lightly salted water to boil for the gnocchi. Chop the onion and mice the garlic. Heat the oil a large skillet. Add the chopped onion and saute until glassy. Add the minced garlic and lightly saute. Add the prepared kale and cook until wilted. Add the drained beans, canned tomatoes, Italian seasonings, cayenne and salt and pepper as desired. Cook the gnocchi in the salted water – it only takes a few minutes until they are floating. When the gnocchi are cooked (floating) drain off the water. 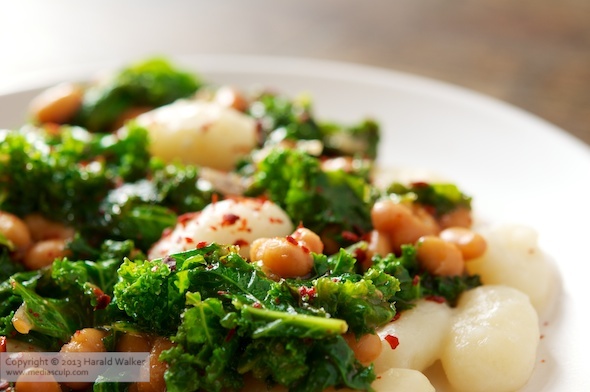 Serve the gnocchi with the kale and bean mixture, or mix the two altogether. As a short cut, one could also use beans in tomato sauce and of course, not drain them. 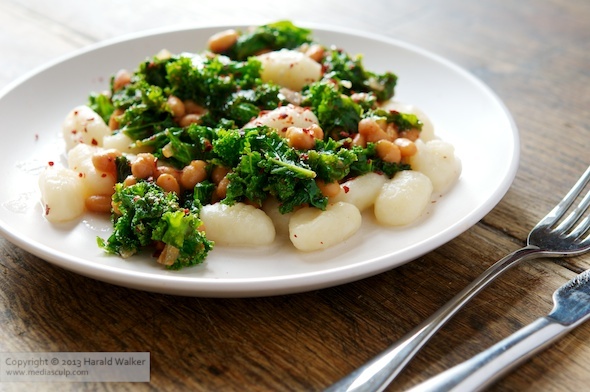 Posted by Chris Walker on January 9, 2012 in Beans, Gnocchi, Kale, Main Dishes.